Serving as a central location to explore, work or enjoy the legendary St. Lucia Holidays with fun island adventures, these private villas and townhouse style apartments for rent in St. Lucia offer a relaxing, spacious home to come back to at the end of a busy day. For vacations and long stay living, Poinsettia Apartments St. Lucia, is a premier choice for singles, couples and family vacations. 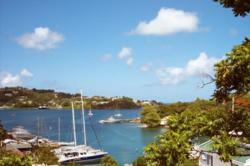 The resort is on a hilltop overlooking the Caribbean Sea, the shallow draft marina and the picturesque cove and harbor. The view of the ocean and the coast area is spectacular. The Poinsettia lifestyle is distinctive; there are no crowds, no groups and no hassle. It is an understated, mindful lifestyle that appeals to the traveler who wants to escape and enjoy nature. "We don’t host big groups, who spoil the privacy. We keep it simple and personal," says Margaux Daher, one of the owners. Here guests enjoy the sounds of nature, surrounded by fruit trees and quiet understated charm of an island oasis. Even the Egrets return for the spectacular sunsets on the seaside bay at the foot of Poinsettia Hill, just below the resort. The video takes the viewer through the complex to show the amenities and lifestyle available for St. Lucia vacation and holiday packages. The idea is to both showcase the apartment villas and show why St. Lucia holidays are so popular. Poinsettia holiday apartments are owned by a family who are the resident landlords for the island estate which includes its own private organic garden of herbs, fruits, vegetables and provisions. The family also maintains and manages the resort which is just below the family home. Personal attention to detail and guest care is a priority and the quality of a stay both for short term and long term rental is assured. Here guest can talk directly to one of the owners, who is passionate about the property, and genuine about making guests feel at home and their trip memorable. Whether visiting on a long stay or on a St. Lucia holiday, the video makes it clear that Poinsettia is an ideal place to stay because of its location and its unique style of villas and townhouse apartments around a central resort setting with tropical fruit trees, gardens, pool, deck and magnificent view of the surrounding hills, ocean, cove and marina. The apartments are also ideal for St. Lucia romantic holidays and visits for Valentine’s, honeymoons, weddings or just for a romantic getaway at anytime. The video shows why Poinsettia apartments - villas are perfect for Caribbean self-catering holidays, with units that are fully equipped and include all the amenities of home and a complete kitchen. After a day of exploring the island’s many attractions- from the world’s only drive-in volcano, sulphur springs, waterfalls, rainforests to sailing, hiking, and sightseeing- this special St. Lucia holiday retreat is a “Great Place to Come Home To”. Strategically located near Vigie Beach and close to the local airport, town and markets, the Poinsettia apartment villas are convenient for all types of adventures on a Caribbean holiday in Saint Lucia. For more information visit Poinsettia Apartments Website or call (758)456-0469.